You wanna get updated with the newest hair fashion and style? And you can’t help but desire to try them all one at a time. Well, take a look at all these women’s colorful hairstyle and freely covet their looks as you add them to your lengthy list of hairstyle that you want to try someday, or maybe next week, or tomorrow! Now, you can be inspired and get some latest hair ideas from silver granny strands and cosmic coifs to the one of the most updated and trendy HyperColor hairstyles. But here’s another trend of hairstyle where you can actually get your total hair transformation by simply dyeing it, the unorthodox way. The latest internet craze for woman’s hairstyle is none other than, “Sunset Hair“. 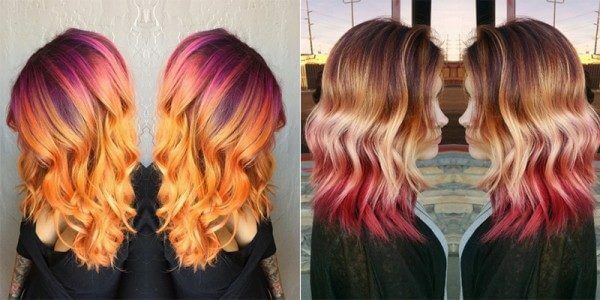 This kind of hairstyle essentially, turns the gleaming colors of the sky with red, orange, pink and violet shades into a very spectacular hairstyle. There are unlimited ways which you can venture into, with these stunning shades, and you have all the time in the world to try these in your hair and feel free to choose the best ones that fits your taste. Photos below will absolutely define the latest trend in hairstyle. New trend to look forward to is coming…just look at the horizon. By simply mimicking the sunset shades unto their hair strands. Sunset hair is now the newest hair craze. You will appreciate the remarkable colors of twilight even more with this sunset hairstyle. Dyeing your hair with these colorful purple, pink and orange hues will definitely mesmerize you. You made the right choice with this magenta-colored hair. …and this very ravishing purple curls. A fiery red orange braided hair.